Open Hearts Ministries, which ran a school inside Managua’s garbage dump (La Chureca), had to move when the dump was transformed into a landfill in the spring of 2013. The ministry lost its building in the former dump, but, with the help of Austin Samaritans, a property in the new community of Villa Virgen de Guadalupe close to the reclaimed dump, was purchased. In addition to one large functional building, the sizable lot also had the beginning of a second building. It had four walls – but no roof, no floor, and no windows. Austin Samaritans’ mission teams this year have painted the wall surrounding the site, installed ceiling fans in the larger multi-purpose building, and helped plaster the wall of the unfinished building. The smaller building, when completed will become a kitchen, dining hall, and tutoring area. Mission participants this coming October will help install a vegetable garden on the property and plant fruit trees. The garden’s produce will be used for the feeding program and to help the ministry become self-sustaining. The ministry itself underwent a transformation, when it moved from the old dump site. Instead of a school, Open Hearts has formed Club Cristiano la Esperanza (Christian Club of Hope), a multi-faceted program to strengthen and enrich the lives of children living in poverty, many of whom lived in La Chureca, the former dump. The ministry now consists of a Christian pre-school with 98 children, a mentoring program for 200 grade-school students; a twice-a-day feeding program for these children, and more. A scholarship program has been created, as well as a high school youth group and a La Crosse team which plays in a local league. Guitar and art classes are also offered. It is a place full of activity, learning, and joy as children are helped to succeed in school, encouraged to continue their education, and offered a variety of extracurricular activities to explore, while learning how much God loves them. Tom Lye, second from left, completed his three-year Board term with austin Samaritans this summer. The only reason we let him go was his promise to keep working on our annual Golf Scramble. Tom has been an invaluable member of the Golf Scramble planning committee, as well as an enthusiastic and faithful Board member. Beginning first as a player in the golf tournament, Tom became more involved with Austin Samaritans and graduated to service on the Board of Directors, serving as the liaison to the golf fundraiser committee. In 2013, he was awarded the first ever “Sponsor Magnet Award” for recruiting 16 sponsors for the tournament. He deserves much of the credit for the 2013 tournament raising significantly more funds than previous tournaments. He has recruited others to serve on the committee and has a lifetime job as far as we are concerned. Thank you Tom! Farewell to Claudia and Bill! It was with a mixture of sadness, laughter, and deep gratitude that Austin Samaritans bid good-bye and God bless to founding board members, Claudia and Bill Biel. Claudia and Bill were part of the original group that returned from a mission trip to Nicaragua in 2006 and felt God was calling them to do something about the people suffering in poverty and deplorable conditions. After helping to found Austin Samaritans, they devoted themselves to our cause for seven years, including numerous mission trips to Nicaragua. Bill, a general practitioner in Elgin, Texas, shared his medical skills and expertise while Claudia helped run vacation Bible schools, worked with women coming out of prostitution, loved abused and abandoned babies, and did anything else she found that was needed. 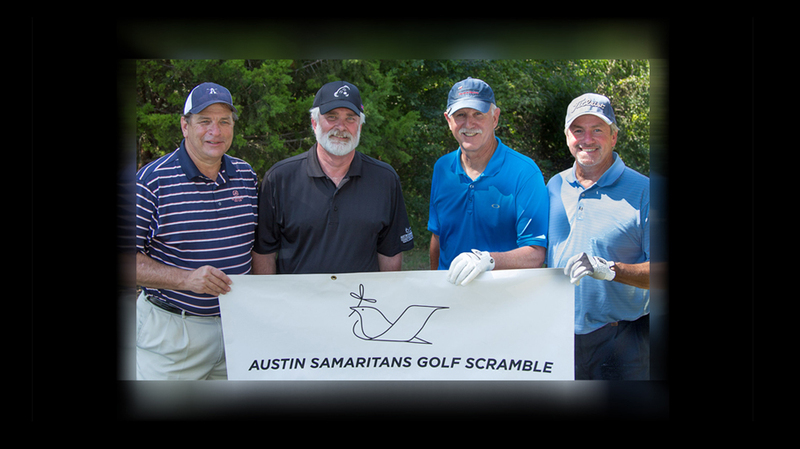 Both of them were willing to dig in and help, whether it was working in the hot sun to build a home in Nicaragua, sharing Austin Samaritans’ story with others, or registering golfers at our annual fundraiser. We miss them very much, but our prayers are with them as they move on to new challenges and family responsibilities. They will continue to promote Austin Samaritans and volunteer. They are gone from the Board, but remain in Austin and in our hearts. Austin Samaritans hosted a family mission trip for Hill Country Bible Church Dripping Springs July 26 through August 2. Lead Pastor Jason McNutt, Executive Pastor Steve Isgitt, and 13 others from the church, including three family groups, spent a week in Nicaragua. Their hearts were deeply touched by the plight of many women and children, who are not only living in poverty, but who are wounded by physical abuse, sexual abuse and exploitation, abandonment, and malnutrition. As one team member put it, “God has shown us some things that are hard to bear.“ He also reflected, “we see plenty of grace and mercy in action, in the work of people living out their lives to serve ‘the least of these’ “. We pray for this church as they seek to follow God’s leading in discerning if ministry to the people of Nicaragua is in their future. 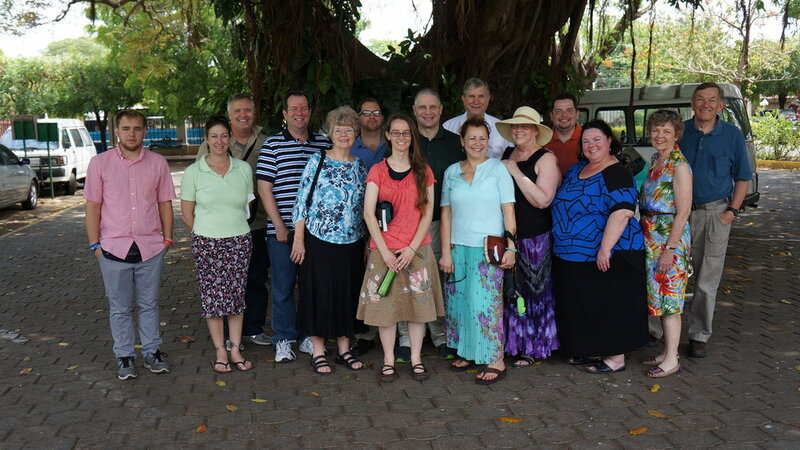 Following the medical mission trip in May of 2014, thirteen people joined Dr. Doty and Peggy Gentry, Board Chairperson, for a general mission trip. This enthusiastic group ranged in age from 19 to 75 years and included a recently retired fire chief; a psychiatrist; two breast cancer survivors; four employees of Coursetrends, an online marketing solutions company for all things golf; an environmental consultant; and a budget analyst. What did these people, most of whom had never met each other, have in common? Mixing plaster for building at Club Cristiano. Each of them had a spirit of adventure and a desire to love and help, in some small way, those who struggle in poverty. Walls were plastered at Club Cristiano, which runs a kindergarten, feeding program, and a grade-school mentoring program. Vacation Bible School was provided at Colegio Cristiano Presbiteriano (CCP) and at Club Cristiano; Spanish Bibles were delivered to Club Cristiano, breast cancer patients were visited and given gift packets made by the Bosom Buddies cancer support group in Austin. In addition, 15 lucky children from Club Cristiano made a trip to the zoo. Each team member felt they had something to give and all received the satisfaction that comes from giving and serving. Fundraising to build a new facility for the former Clinica Base de Salud, which was located inside Managua’s city garbage dump, and served the residents in the dump, has been going very well. The clinic has been renamed Villa Guadalupe Clinic after the newly constructed community it serves just outside the dump turned landfill. Manna Project International, which supports the clinic, has purchased the land. Manna Project and Dr. John Doty took on the challenge to raise funding for the clinic’s construction. Clinica Casa Base de Salud had to move suddenly in early 2013, when the dump was transformed into a landfill. All of the former residents of La Chureca, the community living inside the dump, were relocated to the new community of Villa Virgen de Guadalupe (Virgin of Guadalupe Village) just outside the old dump. The clinic has been operating out of tiny quarters in this new community. To make matters even more challenging, the clinic is serving a population three times as large, because other groups were also relocated here. It is apparent a new facility, adequate for the increased demand, is needed. We are happy to report that each day is bringing the clinic closer to its “Cinderella” transformation. The clinic hopes to break ground later this year. Read more about the clinic. Families in the U.S. celebrate their children’s and grandchildren’s high school graduations . However, for the young women who participate in Villa Esperanza’s program for at-risk girls, girls who come from poverty and abusive situations, high school graduation is an even more significant achievement. Perla and Katherine were two of the first participants to come to Villa Esperanza when it opened in 2007. Through its provision of a loving and safe home, education, healthcare, encouragement, and exposure to the Gospel, Villa Esperanza has helped re-direct the lives of these girls. Austin Samaritans has been leading mission trips to Nicaragua for six years – you are in good hands. If you have been with us before, we invite you to join us again and bring a friend. Every person’s experience is different, but we can promise that your eyes will be opened to the hardships and challenges faced by many around the world, and your heart will be touched by what you see. The activities vary from trip to trip, but often we assist our mission alliances through doing construction or maintenance work, offering Vacation Bible School for school children, teaching English and hygiene, sharing cancer packets and prayer with women suffering from this disease, holding and feeding malnourished infants and toddlers, and visiting and interacting with young women at high risk of sexual abuse and exploitation. Cervical cancer is the leading cause of death in Nicaraguan women who are between the ages of 30 and 60 years. It is SO preventable and treatable if detected early! But, in Nicaragua, so many women lack the information and financial resources to access prevention. Austin Samaritans is helping address this situation. Dr. John Doty, our Founder, was instrumental in initiating a program to screen and treat women in Nicaragua for cervical cancer. In 2009 Dr. Doty worked with one of Austin Samaritans’ mission alliances, Fundacion Ortiz Gurdion, or FOG, to add the cervical cancer program to their existing breast cancer program for women whose annual income is less than $2,000 a year. Read more here. From left: Dr. Ortega, Gynocological Surgeon; Patricia Ortiz, Founder of Ortiz Gurdion Cancer Clinic; and Dr. John Doty. 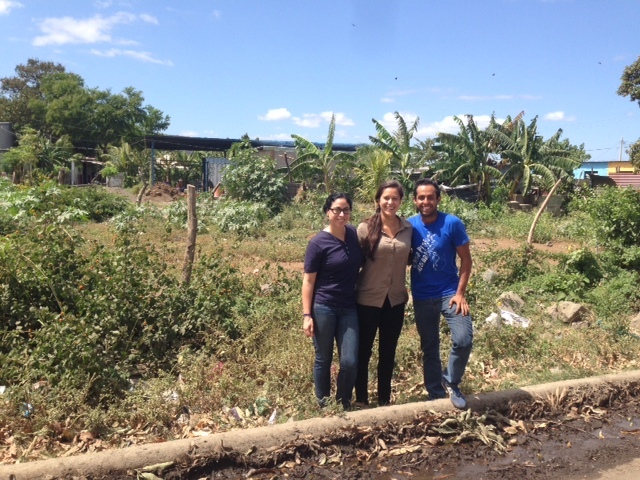 Hooray for Adriana and the Matagalpa Re-Nutrition Center! Adriana with her mother just before Christmas 2013. Children all over deserve a healthy happy life but that isn’t always possible. 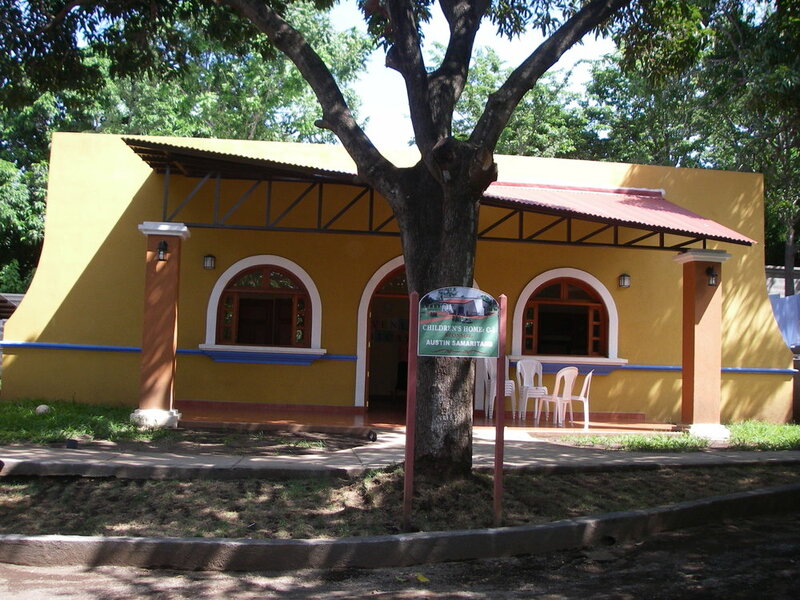 The center provides a shelter for children to help them feel safe and return them to a healthy state. Your faithful donations you have made the center a reality for these malnourished precious children. They not only receive food but also but are shown the love of Christ through the nannies who care for them. The nannies are so good to sing praise songs with them before their meals and teach them to pray. One young girl Adriana, was severely malnourished. One of the nannies told me that one of the first nights that she was there she heard someone singing and when she went searching to find out who it was Adriana. Adriana was singing ‘Lift My Arms Because I don’t have the Strength’. It is a song of someone very weak wanting to praise God. God has healed her and she is a happy healthy little girl. Thanks to all our wonderful Golf Scramble sponsors and donors that made this year’s tournament a success! We welcome new players, sponsors, and volunteers! “For me, the most rewarding part is the people-to-people connections where we could lend a hand or a finger to make a difference.